Cut plastic handpiece along elastic webbing edge at thumb side of the handpiece. Allow tubing to curl in on itself. Cut tubing along both sides of elastic webbing and remove distal 2/3 of handpiece. Pinch tubing to decrease size and tape with strapping tape. Cover handpiece with moleskin to pad any tape wrinkles and rough edges. Fold the elastic between the handpiece and the wrist cross in half by taking the first finger edge of the elastic toward the thumb. The blue pin stripe begins to show when the elastic is close to being folded in half. Take a needle and thread and stitch the folded elastic to hold it in place. The elastic can also be folded on the pinky side of the sling if necessary. Cut tubing and remove handpiece. Attach sticky back Velcro hook to splint. Coordinate hook position to loop Velcro sewn onto GivMohr elastic. 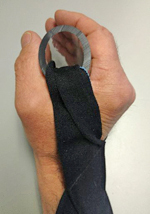 Attach hand splint to GivMohr Sling using hook and look connection. Adjust for maximum comfort and function. 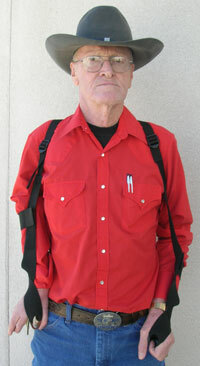 Mixing shoulder harness and arm strap sizes is available to accommodate unique sizes of individuals. 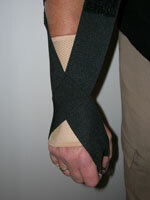 For bilateral sling clients, this can be used to accommodate the difference in arm lengths.